Dr. Springstead uses a variety of methods to ensure that each individual receives best possible treatment. Below is a list of the services offered to patients in our office. Foot Levelers Custom Orthotics: When the body does not have a balanced foundation it can cause pain and discomfort in different areas of the body, as well as postural stress. Orthotics are used under the feet to provide a stable foundation and balance for the body. 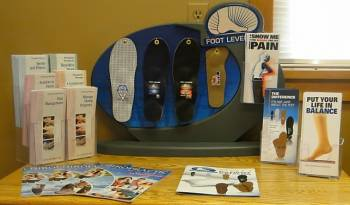 Click the link above to visit the Foot Levelers website and learn more. Ultrasound: Chiropractors use ultrasound therapy to aid in the healing processes of soft tissue, muscle, tendons and ligaments through micro-massage mechanisms. Trigger Point Therapy: Trigger point therapy involves stretching and deep manual pressure to relax knotted muscles and relieve pain and tension. Traction: Traction can be used in conjunction with chiropractic adjustments to correct spinal subluxations and gradually help the spine back to a healthy position. Flexion Distraction: When using flexion distraction, the chiropractor has the patient lie on a specialized table that gently stretches the spine, which allows the chiropractor to locate affected areas while flexing the spine.